A couple of weeks ago, I wrote that this Friday, February 28, at 7:00 pm at The Armory (300 Strong Street in Brighton), theater goers will delight in Imagine! Out & About’s Fourth Annual Centre Stage Production. This year’s performance is of an original play entitled “The Menace in Venice.” Admission is free (donations will be gladly accepted), with general admission seating. I’d love to see you there. But even if you can’t make it, you can still be a part of this enriching community program. Out & About has launched a crowdfunding campaign to help cover some of the extra costs that arise in hosting this class and performance each year. Watch the video below to learn more, and if you are so inclined, please click here to support Out & About’s Centre Stage Program. Labor Source, the supported employment division of Imagine!’s CORE/Labor Source, is celebrating its 30th Anniversary this year. To celebrate this important milestone, each week I am publicly thanking and recognizing Labor Source’s many local business partners. Supported employment offers people who have a disability the opportunity to develop vital job skills and become active participants in their communities. The benefits extend far beyond helping our clients, however. Businesses using our services are able to reduce recruitment and training expenses as they benefit from a diversified employee pool. Partnering with CORE/Labor Source is a “win-win” situation that is beneficial all around. Today’s Labor Source 30 for 30 partner highlight: Twisted Pine Brewing Company. 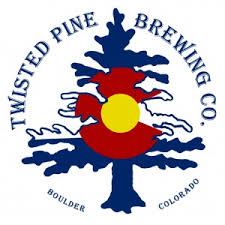 Twisted Pine Brewing Company’s first pints were brewed by craft beer industry legend Gordon Knight in 1995. Gordon acquired some of the original New Belgium brewing equipment and started brewing in a small facility on Valmont Road in Boulder. In 2003, Twisted Pine outgrew its small facility on Valmont Road in Boulder and moved to a much larger facility once occupied by the Oasis Brewing Company. The move allowed Twisted Pine to expand capacity and open a Tap Room in the front of the brewery. The Tap Room quickly became a popular meeting place for locals and visitors alike. Today, Twisted Pine is driven by experimentation in brewing and strong community involvement. Over the past year, Twisted Pine Brewery has employed 18 CORE/Labor Source participants at various times. Twisted Pine has been employing CLS participants since 2011. Thank you, Twisted Pine, for your commitment to your community and to providing employment opportunities for individuals with intellectual disabilities. Beyond the many services we provide, Imagine! is frequently offering classes, workshops, and other events that may be of value to the people we serve, their families, and the community at large. Public Insurance 101 will focus on services like Medicaid and Children’s Health Plan Plus (CHP+). Private Insurance 101 will explain the benefits available under Health Insurance Mandated Autism Treatment (HIMAT), healthcare reform and the Affordable Care Act. Engaging in Your Government lays an important foundation to understand the role of the federal and state government in Colorado. Attendees will identify their legislators, learn how to share their story, and identify policy issues that affect them. All presentations will be hosted at the Imagine! John M. Taylor Conference Center, located at 1665 Coal Creek Drive in Lafayette, CO 80026 in the Pounds Conference Room. RSVPs are required. For questions or to RSVP, please contact Kim Tenure at (720) 214-0794 x 15 or kim@autismcolorado.org. To learn more about these trainings, and to find out about many other events (Imagine! sponsored and otherwise) happening in our area, check out Imagine!’s online Community Calendar. Today’s Labor Source 30 for 30 partner highlight: Rock Bottom Restaurants. Rock Bottom always has been and always will be about the beer. Every tank we tap represents hours of planning, experimentation, ingenuity and precision by your local Rock Bottom Brewmaster. While we pride ourselves on the remarkably consistent quality of our beers, we're just as dedicated to letting the personality, experience and particular expertise of each Brewmaster shine through. Over the past year, two local Rock Bottom Restaurants have employed 35 CORE/Labor Source participants at various times. Both have been employing CLS participants since 2002. Thank you, Rock Bottom, for your commitment to your community and to providing employment opportunities for individuals with intellectual disabilities. We have a couple of upcoming events that offer the opportunity for people to experience the creativity and artistic abilities of some of the individuals receiving services from Imagine!. On Friday, February 28, at 7:00 pm at The Armory (300 Strong Street in Brighton), theater goers will delight in Out & About’s Fourth Annual Centre Stage Production. Centre Stage works this way: class participants get the opportunity to learn the basics of theater. Each activity focuses on integral aspects of theater production, including acting, singing, dancing, choreography, set and costume design, and lighting. Throughout this class, participants work together to create a stage production. At the end of the class, the group performs its show before a live audience. This year’s performance is of an original play entitled “The Menace in Venice.” Admission is free (donations will be gladly accepted), with general admission seating. Pictured below is John at a recent rehearsal of the play. 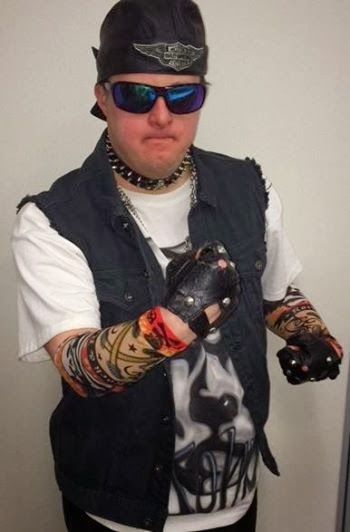 John plays the role of Cruiser in the performance. And Imagine!’s CORE/Labor Source department is preparing for their annual art show and theater performance, scheduled for Friday, March 14, at the Dairy Center for the Arts (located at 2590 Walnut Street in Boulder). 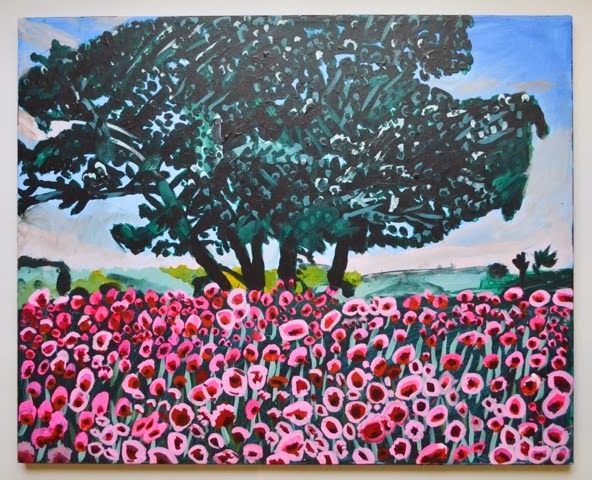 The art show is from 5:30 – 7:00 pm, and art work created by artist/consumers in CORE/Labor Source art classes (including the lovely piece pictured below), will be for sale. The theater performance is at 7:00 pm, and this year’s show is a presentation related to The Wizard of Oz. Both the art show and theater performance are free of charge (donations will be accepted). I hope to see you at one (or both) of the shows! Bonus holiday themed creativity alert: check out this original Valentine’s Day story written by Mandy, who lives in Imagine!’s Bob and Judy Charles SmartHome. To celebrate this important milestone, each week for the next 30 weeks, I will be publicly thanking and recognizing Labor Source’s many local business partners. Today’s Labor Source 30 for 30 partner highlight: In Clover. For over a decade, In Clover has been developing the highest quality natural supplements designed to enhance and maintain vibrant, active and healthy pets. Their innovative products are based on solid scientific research. The high levels of active ingredients quickly support joint, digestive, immune and dental health, so pets and their humans can continue to enjoy all of their favorite activities together. With In Clover, “10 is the new 6″ for pets! Over the past year, In Clover has employed 24 CORE/Labor Source participants at various times. Thank you, In Clover, for your commitment to your community and to providing employment opportunities for individuals with intellectual disabilities. Today, I’d like to share good news about two Imagine! employees who have been nominated for prominent awards based on their stellar work and commitment to the individuals we serve. Isaac Marin, Assistant Site Supervisor at the Charles Family SmartHome in Longmont, was recently nominated for an Alliance Direct Support Professional of the Year Award. The winner of this award will be announced Wednesday, February 19, at Alliance’s Awareness Day for Individuals with Intellectual Disabilities at the Denver Art Museum. We found out earlier this week that Isaac is one of five finalists for the award! Below is information from his nomination that demonstrates why he was nominated for this prestigious award. 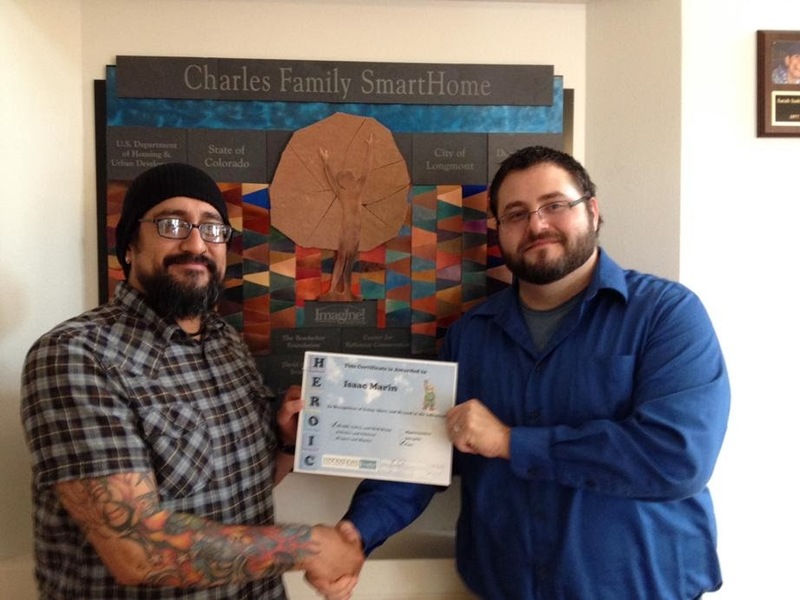 Isaac Marin (left), seen here being honored with a "Hero Award" from Charles Family SmartHome site supervisor Chris DiRosa, has been nominated for a prestigious Alliance Direct Support Professional of the Year Award. Isaac Marin has been a Direct Support Professional with Imagine! since 2008. At that time, Isaac worked at a group home where five adolescent boys in the foster care system lived. The residents at the home frequently had a difficult time managing their behavior, and helping them to find replacement behaviors for intrusive, dangerous outbursts was on ongoing issue. One of Isaac’s coworkers commented that during outbursts by the residents, Isaac’s calm yet firm demeanor was instrumental in helping the residents successfully redirect themselves. Isaac also made himself available to his coworkers to help them process what had occurred when things calmed down. His positive attitude helped his coworkers to recognize that their efforts were valuable. Another piece of this story is that Isaac made one of the foster children in the house his apprentice carpenter. This resident had many skills with carpentry, along with a genuine interest in that sort of work, but due to his behavioral challenges, he had not been successful with obtaining or maintaining employment. As Isaac’s apprentice, he learned valuable job skills in a safe, controlled environment, making minor repairs at the group home. The consumer, who is now a young adult, is able to include on his resume that he has experience as an apprentice carpenter because of Isaac. During the flood in September, there was a weekend where a lot of things went wrong with staffing at the house and Isaac did an exceptional job with helping in any way that he could to get staff to cover shifts and to be proactive with covering the house. Isaac’s most recent noteworthy effort was just a month ago when he missed attending a Denver Broncos game against the San Diego Chargers that he had a ticket for, due to a direct care immediate need. He wasn't scheduled to work, but he went ahead and helped a co-worker take a resident to a seating/wheelchair appointment in Englewood. The appointment went far past the scheduled time frame and when they got back to the group home, it was too late for Isaac to attend the game. And Isaac handled this with grace and good cheer. Once again, Isaac placed his service to others above his own plans. Isaac is a great asset to the team, and an example of fantastic servanthood to the community we serve. And Kelsey Young, who works for Imagine!’s CORE/Labor Source department, was recently nominated for an ANCOR Direct Service Professional of the Year Award. We expect to hear an announcement on the winner of this award soon. Below are various quotes from her nomination that indicate why she was selected for this esteemed national honor. Kelsey Young (r) has been nominated for an ANCOR National Direct Support Professional of the Year Award. She is pictured here with John, who receives services from Imagine!. Kelsey was instrumental in the successful job training of a student who is enrolled in the Project Search Job Internship Program. This student now works in the business office at Boulder Community Hospital at a job requiring accuracy and close attention to detail. The job training was difficult, but from the start Kelsey showed her enthusiasm and energy. She wrote detailed job task analyses for a step by step learning process for this student. Kelsey became aware that this student was having difficulty with low self-confidence and was hard on herself when she made any errors. Applying creative energy and compassion, Kelsey was able relate to this student's particular learning style. Kelsey's positive attitude and cheerful manner created an effective learning environment for this student and boosted the student’s morale. This student is now working independently and performing detailed tasks such as filing secondary claims and preparing certified mail. The people we serve ask about Kelsey regularly and want to know what day(s) she is scheduled to work with them. They thank her multiple times a day. Kelsey’s supervisors report that they consistently have class supervisors request for her to be in their classes because they know that with her in the room there will be nothing left undone. Kelsey has taken the time to develop personalized nicknames and handshakes for the people she works with that help them to know they are respected as individuals. She takes advantage of transportation time in the company cars to develop relationships with the people we serve. (by empowering them to work out a fair system of who gets to sit in the front seat or what radio station to listen to). R.S., a consumer, said he appreciates that Kelsey takes the time to listen and understand a situation before reacting. Kelsey uses role modeling as a way to be an advocate. When in the community with people we serve, Kelsey demonstrates how to respectfully interact with them. It’s almost like she’s in a theater performance only she uses smiles and a quiet, calm voice instead of commanding attention. It would be easy for a community member to think that Kelsey is out with a brother or sister because of the reverent way she treats the people we serve. She facilitates successful, community involvement by being attentive to the body language of non-verbal consumers, and listening intently to the concerns of those who are able to voice them. Just last week I observed Kelsey at the bowling alley during a class, and although the environment was crowded and over-stimulating, Kelsey kept everyone focused on either bowling or cheering on others who were bowling. When the floods recently swept through Colorado, although her home was deluged with flood waters and it would have been understandable for her to try to salvage her personal belongings, Kelsey braved the roads to help out her colleagues in a tight spot. Our employees displaced by the flooding were allowed to be paid by using sick time, including sick time donated by coworkers, but Kelsey sought out ways to help others. She found out that the staff at this home had worked many hours without relief so she went there. When asked what was most rewarding about this, Kelsey said, “Seeing the look on the face of the staff who knew he could finally go home, and the cheerful greetings of the residents I know.” She not only cared for the consumers but also helped to rid the basement of four feet of water using buckets and vacuums. Congratulations Isaac and Kelsey, and good luck! I’m honored to work alongside of both of you. Where Is Your Throttle Set? As I walked the halls of Imagine!’s offices on Monday, I saw a lot of downcast faces. Located in sunny Lafayette, CO, we have a strong contingency of Denver Broncos fans, and Denver’s blowout loss in Sunday’s Super Bowl seemed to leave many in a sour mood. While I am not originally from around here, and still hold my loyalty to another team (which I won’t mention), I have lived in Colorado long enough to have developed an affinity for the Broncos, so I could relate to feelings of discomfort. That won’t stop me, of course, from making some observations about things I heard both before and after the game, and connect them to the work we do at Imagine!. Taking advantage of significant snowfall in the mountains, I went up skiing Sunday morning to get in a few fresh powder runs before heading back home to Boulder to watch the game. On the way home, I listened to the pre-game show on the local radio station. The show featured interviews with Broncos players, coaches, and management. All of them, when asked about the mood of the team leading up to the big game, said something about how relaxed the team was, and how they were treating and preparing for this game like any other game. I think the final results would indicate that perhaps this wasn’t a good strategy. Now, I know that you can’t put too much value on what sports figures say in interviews with the media. For the most part, they are trained to not say much of anything publicly, lest they somehow give their opponent extra motivation. But the “relax, this game is no different from any other” refrain came up enough for me to think there was some truth to it. I can often be heard using the term “throttled back” when speaking of my personal relaxation. Makes a person wonder about the position of the Broncos throttle on game day. Unfortunately, not all games are created equal. The Super Bowl isn’t like any other game, and the Seahawks’ throttle was forward as they recognized that this game was more important than most. I see parallels in our field. Not every day or every task at Imagine! is equal. Sometimes we have to prepare a little extra, or we have to focus a little sharper. A day spent getting caught up on paperwork is not the same as a day spent meeting with a family who just learned that their infant child has a developmental delay and will need services. We need to prepare for those two days in different ways. And if we aren’t able to see the difference, we can put ourselves at risk of not being up to the task at hand. Now, I get that he was probably disappointed, and being interviewed after a painful loss on the biggest stage in football can’t be a pleasant experience. So I don’t fault him for his response. But I must vehemently disagree with Mr. Manning. Failure can be embarrassing, and there is nothing wrong in admitting it. Heck, simply stumbling while walking up a set of stairs is embarrassing. I know this has been said many times before, but failure and embarrassment can be significant learning experiences. If we shut off the possibility that we can be embarrassed, we potentially shut off the opportunity to learn from the experience and apply those lessons in our subsequent actions. There have been moments (more than I should probably admit) where my actions at Imagine! have led to failure and embarrassment. We work in an environment where the unexpected is common, and anyone who positions themselves above embarrassment, or who says they have never made a mistake in our field is either untruthful or so uncreative in their work that they shouldn’t be doing it in the first place. As an organization and as individuals, we need to have the strength to admit shortcomings and embarrassment and move forward, hopefully better for the experience.